2 random succulents from the local nursery. I got these two little plants from the local nursery. Despite my inquiries about exactly what they were and what their care requirements were they successfully ducked the questions and now I'm trying to determine exactly what I am dealing with. Any help would be greatly appreciated. Hi Mike, what you have just encountered is the whole reason for this page! I try and identify you plants so you can care for them properly. Luckily for you, I can tell you exactly what you have! The rounded blue one is Echeveria elegans, and when they're curled up in a ball like this it usually means they are experiencing severe drought conditions. Once they start to get a bit more water (not too much though) they open out and show their characteristic shape. You can see more about Echeveria elegans here, and detailed growing information on how to grow Echeveria here. The spiky little guy is one of my favorite Aloe; this one is known by both Aloe juvenna, and Aloe zanzibarica - I'm not sure why it gets called by two names, but if you follow the instructions on succulent care here you'll have great success with your new collection. Hopefully you'll be more confident in your ability to grow them, now you know what they are. 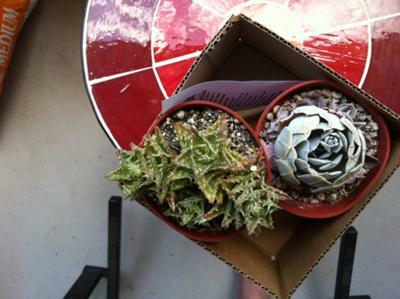 Succulents can be a fascinating hobby, and I bet you'll be looking for more to add to your collection!